Choose this picturesque Winslow hotel and enjoy easy access to many Northern Arizona attractions, including Homolovi Ruins and the Petrified Forest. You'll feel right at home at the Winslow Inn, as the spacious, luxurious rooms offer high-speed Internet access, cable satellite television with HBO , a refrigerator, a coffeemaker, a desk and much more. Make your stay extra special with a Deluxe Honeymoon Suite or Presidential Suite. Fill up before you head out - we offer a complimentary full breakfast. Relax and play in the indoor heated pool during your stay. We also offer abundant amenities, including an exercise facility, a 24-hour front desk, free parking, a 24-hour business center and a complimentary newspaper. Whether traveling on work or for a vacation, the Winslow Inn offers the perfect location. Looking to take in the stunning natural scenery? Just five miles away, you can explore Clear Creek, which offers visitors the options of going canoeing, fishing, swimming, hiking or picnicking. The area also offers many state parks and other mesmerizing attractions, including the Petrified Forest, Meteor Crater, Monument Valley and Homolovi Ruins State Park. Plan a longer trip to Grand Canyon, Sedona, Flagstaff, Navajo County, White Mountains and New Mexico, ensuring that you're able to see and do as much as you want while staying at this Winslow hotel. Enjoy attractions in the Winslow Inn's backyard, too - we're near Standin On The Corner, Winslow's historic downtown district, Remembrance Garden and Historic La Posada Resort. If you're looking for a delicious meal, the Turquoise Room, Falcon Coffee Shop and Bojos Bar and Lounge. Those on business can make the most of their trip with Bank of the West, CableOne, APS and Little Colorado Medical Center nearby. We're also near the Arizona Department of Corrections and the Burlington Northern Santa Fee Railroad. 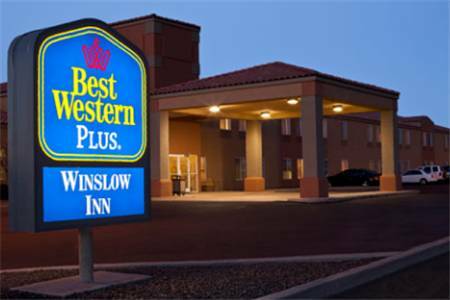 For a relaxing visit to Winslow, reserve a stay at the Best Western Plus Winslow Inn today and save! From: Holbrook. From the east, take Interstate 40 to Exit 255. Turn right, go straight 500 yards, turn right towards the Best Western Plus Winslow Inn. From: Flagstaff. Take Interstate 40 to Exit 255. Turn left, go straight 1000 yards towards the Best Western Plus Winslow Inn. Canoeing - 5.00 mile(s) from Clear Creek, canoeing, fishing, swimming, and picnicking. 1.20 mile(s) from Standin On The Corner, made famous by the Eagles song 'Take It Easy'. 0.30 mile(s) from Remembrance Garden, dedicated to the tragic events of September 11, 2001. 1.00 mile(s) from Historic La Posada Resort, the last of the great Harvey Houses of the 1930's. 1.00 mile(s) from BNSF Railroad, Winslow's historic downtown district. A 1970s rock lyric has been transformed into a 21st century tourist photo op. It's like traveling back to 1950 when you snooze in teepee motel comfort at this Route 66 landmark. A packed gathering of brightly painted, homemade prehistoric creatures just off of Route 66. Highest dino density per square foot.